First, tweeted Michael Rosen recently, they came for Mary Seacole. He was echoing a famous poem about resistance to totalitarian rule. And, he continued, because I’m not a woman and I’m not black, I didn’t speak out. Well actually, Rosen himself has spoken out with characteristic eloquence about Mary Seacole and her place in the national curriculum in England. And well over thirty thousand people, so far, have signed a petition urging that she should continue to feature explicitly in the teaching of history in schools. There was recently a letter from Jesse Jackson and 50 others about this in The Times, the Archbishop of York has weighed in with an article in the Sun, an early day motion is currently open for signature in parliament, and the issue appears to have split the coalition government wide open, with Nick Clegg pledging he will oppose the new plans for the history curriculum which, according to leaks, Michael Gove is shortly going to announce. Adding to a widespread sense of outrage, there are rumours that Gove’s private office has blocked access by civil servants at the Department for Education to the website of a distinguished professor of education who has dared to criticise the plans. Next, Rosen’s pastiche might continue, they came for the academics. There are several different conversations taking place, each of them deeply emotive, significant and momentous. Is Mary Seacole rightly considered to be an iconic figure in the history of Britain and is it therefore right that she should be explicitly named in England’s national curriculum? And is it similarly right that a prominent proud statue of her should be erected in central London? Or is she being used by the political correctness brigade, aka ‘equality activists’ and ‘multiculture fanatics’, to peddle falsehoods about Britain in schools and through a landmark memorial on the bank of the Thames? What is the true grand narrative about Britain? Is it an island story, as the prime minister contended in his recent speech at Bloomberg about Europe ? ‘Our geography,’ he said, ‘has shaped our psychology. We have the character of an island nation – independent, forthright, passionate in defence of our sovereignty. We can no more change this British sensibility than we can drain the English Channel.’ Has the island been justly and gently ruled over the centuries, as the Tory view of history also contends, by our elders and betters? Or is the essential story of Britain the one told and celebrated by Danny Boyle on the opening night of the London Olympics – a story about ‘we the people’, constantly arguing, constantly struggling and changing, always irreverent and ungovernable, and always part and interactive parcel of the whole continent of humankind, not an island entire of itself? And, not least, who should be involved in discussions and decisions about these matters, and how? This question, about the voices which should be actively heard in conversations about the content and methodology of history teaching, is particularly important at the present time. Elected politicians such as Gove and Clegg should be there at the table, yes certainly. History is too important to leave to the professionals. But politicians bring with them electoral considerations and personal ambitions and a readiness to engage in horse-trading – we’ll give you Seacole, Gove and his friends may say to Clegg, if you’ll give us boundary changes. But others must be at the table too, less encumbered with thoughts of electoral and personal consequences. History is too important to leave to elected politicians. Professional historians need to be at the table too, as do specialist teachers of history as an academic discipline in secondary schools. So do non-specialist teachers of history. Virtually every single primary school teacher has to teach history, though relatively few have themselves studied history as a discipline. They may not know a great deal about the discipline. They do, however, know a great deal, from their lived experience day by day, about how children learn, and do not learn. Conversations about education need to engage a wide range of interests, and to be in public, not behind closed doors. Only thus are decisions likely to be hammered out which have a broad consensus around them, and the deep understanding and public confidence which have to underlie implementation if it is to be effective. But the Tory view of educational policy-making is continuous with its view of history – policy-making in the present is like the fashioning of events in the past, something that can be safely left to elders and betters, something that we the people need not bother our little heads about. As with the teaching of history, so with matters such as new qualifications at 16+ (the Ebacc), academies, the pupil premium grant and free schools. On these matters too there must be widespread public consultation, with many voices given a fair hearing. And there must be due regard and deliberation in accordance with the requirements of the Equality Act – due regard for issues to do with disability, ethnicity, faith, gender and sexuality. In the absence of such due regard and deliberation the Tory view of history will prevail. This will be to the advantage of Tory voters and supporters, very probably, but to the disadvantage of many millions of others. 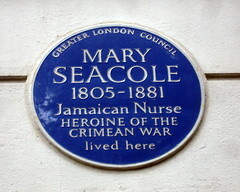 First they came for Mary Seacole.